Alex had hip dysplasia. As he got older and his condition got worse he needed assistance with certain things, like getting in the van. He hated any amount of help and would always glare at us when he needed it. He would put his front paws up on the floor of the van and we would lift his rear end inside. Sometime after this became a daily routine, Silver started to mimic Alex's behavior when getting in the van. If it wasn't bad enough that I would have to lift Alex, now I had to lift Silver as well. 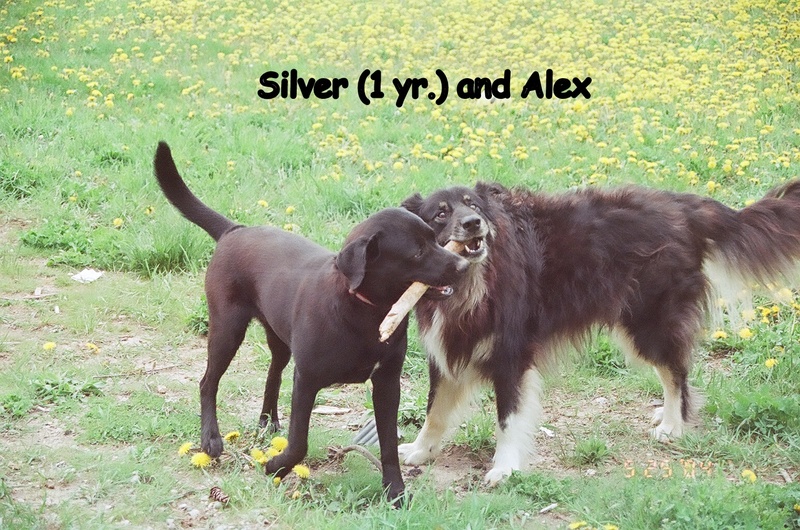 It was cute and funny at first, but as time wore on and we watched Alex's legs decline, Silver's copying became a reminder of how painful Alex's situation was. While we were trying to make the best out of the situation, Silver's behavior emphasised the obvious. Looking back it is still difficult to see how Silver interpreted this pattern. Was she emphasizing with Alex, or just copying him thinking, this is how we get in the van now? Alex was her first and best friend and I know she still misses him to this day. Every so often she will still get in the van with her front paws and wait to be lifted up, letting Alex's memory live on. Sometimes how we wish our dogs could talk and tell us what they think, then we would understand how Silver and Alex think and feel. Who knows what resides in the fertile minds of our little dogs. But actually I'm glad they can't talk, it makes them more intriguing. Aww that is a sad story. Lily often copies what Trixie does, because she watches everything Trixie does and wants to be like her. Maybe Silver wanted to be just like Alex! Oh, how sad and sweet at the same time. Mom said her baby kitty that she had would mimic all the behaviors of her older kitty and thought that she was learning by example. Maybe Silver was imitating what he thought he was supposed to do. Perhaps just copying, but you never know. Some people would say that dogs don't have the ability to empathize, but any pet owner could tell you otherwise. Alex was such a handsome boy. Too bad he was so uncomfortable. Maybe Silver was just thinking that was what he was supposed to do. You were very kind to give Alex that added boost. It's interesting to see that just like people form a special bond with a dog, that dogs can build a unique bond with each other. It sounds like Silver and Alex had that kind of relationship. Of course, Silver could have been thinking of you too. I bet lifting the hind end of a big dog into a van is pretty good strength training. Aw, as sad as this is, it's so sweet at the same time. I think Silver knew how much Alex hated that he needed help, so in order to make him feel better about it, Silver showed him that he needed help too. 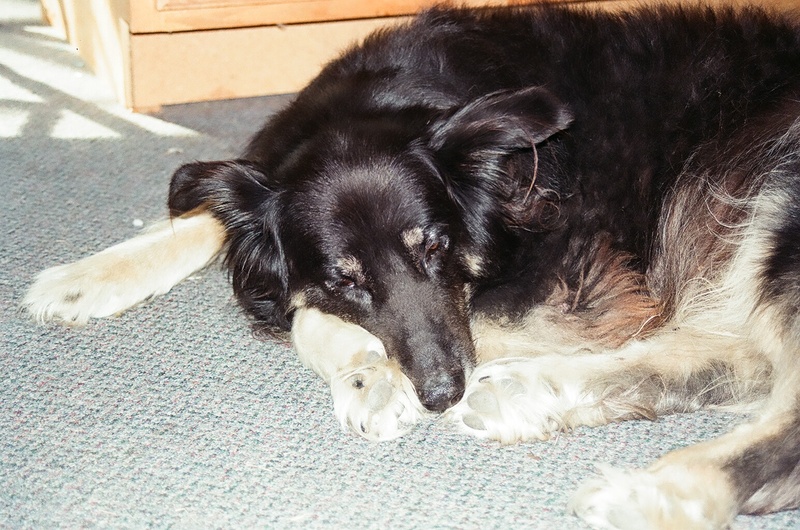 Many years ago I had a delightful Border Collie named Buddy. He was my right hand man and help me rehabilitate many foster dogs I took into my home. One Doberman named Dasha was a foster failure as she was physically beaten on so many occasions and never taken to the vet. She had broken bones healed crooked and she was not what you average person would call a 'beauty'. But Buddy and I loved her for what she was inside so we adopted her in to our family. A solid ten years later Buddy got cancer of the spleen and had to be put down. Dasha was never the same after Buddy leaving us and her heal went fast and so I had to have her put down as well. I believe to this day she died of a broken heart. Her Buddy, her savior, was gone and she no longer wanted to be here either. I dearly miss my two babies they taught me so much about life and who I was as a person. I continue to work in rescue and dog advocacy in their names as I know they would want it that way. One of our first hounds was just a lazy sort of fellow. When he saw our first one start getting lifted while she was ill, he sure worked hard at getting me to lift him, too! The problem was that she was sixty pounds while he was about eighty! I told him I'd give him a push from behind, but he was going to have to take care of part of it himself. I still laugh about some of his antics! I think it's one of the hardest things, to see a dog who's so independent have to have help when he or she doesn't want it. I think that even though Silver's van-entry technique reminds you of Alex's pain, it must be nice to have the reminder of Alex himself. I love how our dogs teach each things, both good and bad, and then the older ones live on in the younger ones. I've always liked having overlap between our generations of dogs for exactly that reason. I'm sorry that Alex had to live with such pain but I'm glad that he was so loved. I think Silver was just showing her support and empathy for Alex. Pure doggy love and friendship. I would guess they were such good friends, that Silver was mimicking Alex's movements like a way of saying it's ok, she would get up the same way so Alex wouldn't feel awkward for needing help. When I saw an older dog giving up food for a puppy, I realised I was looking at the care and compassion dogs show for one another.